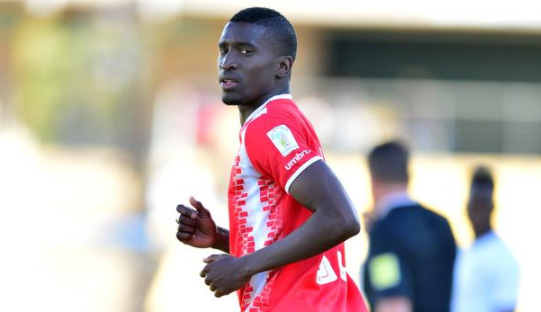 Maritzburg United beat Royal Eagles 2-1 in a Nedbank Cup last 16 match at the Princess Magogo Stadium on Sunday despite playing 45 minutes with 10 men. This after captain Bevan Fransman received his marching orders for a second booking in the 45th minute, before scoring the opening goal in first half added time through Deolin Mekoa. Fadlu Davids' team started the game strongly and were nearly ahead in the sixth minute when Deolin Mekoa smashed a 30-yard against the upright. Eagles though also had chances as Philani Cele headed Mazwi Mncube's free kick over the bar, with Mpho Mvelase doing likewise soon after. Having lost their skipper late in the first half failed to dampen United’s spirit as they drew first blood when after some brilliant work on the flank by Siphesihle Ndlovu, Mekoa reacted sharply to bundle in the ball. Eagles though were not finished and it took a fantastic save by Maritzburg keeper Richard Ofori to keep Cele out in the 54th minute. And the First Division side were back on level terms I the 71st minute when Mame Niang slotted home from the penalty spot after an infringement by Xulu, in what looked a tough call on the Team of Choice. The game was then delayed by close to an hour due a thunderstorm in the Umlazi area. When played resumed, Maritzburg had a lucky escape when Mvelase fired a curling effort into the cross-bar. The Team of Choice, who had shown great fight and character, held their nerve, and the winner came in the 89th minute when Xulu headed in from Mekoa’s inviting corner. Eagles: Nyame, Mosebo, Brown, Manganyi, Cele, Kubeka, Mvelase, Niang, Sauls, Nene, Mncube. Subs: Ndwandwe, Nkewana, Makgothi, Mashiane,Hlongwane, Ngubo, Zongo.